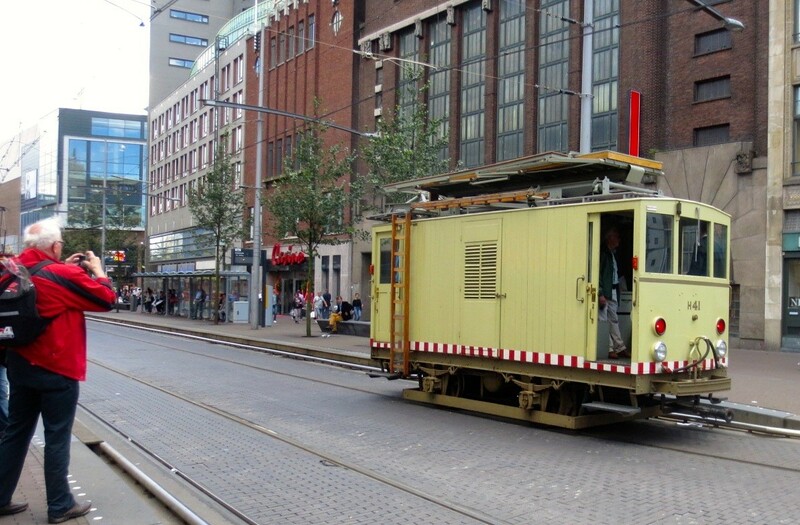 Word of the Day: TRAM, tram – Welcome to the Direct Dutch institute, The Hague. So you live in or near The Hague… You’ve been here for quite some time now… And yet, you admit that you hardly know the place. You’ve explored your neighbourhood and you’ve seen the city centre. Maybe you’ve even visited Madurodam and you may have sniffed fresh air on the modernist boulevard in Scheveningen. And maybe, possibly maybe, you’ve cycled to work, but that’s about it. You’ve heard some fascinating stories about The Hague, but you don’t really know the place where you and your loved ones have been frittering away. What a pity! And so unnecessary. 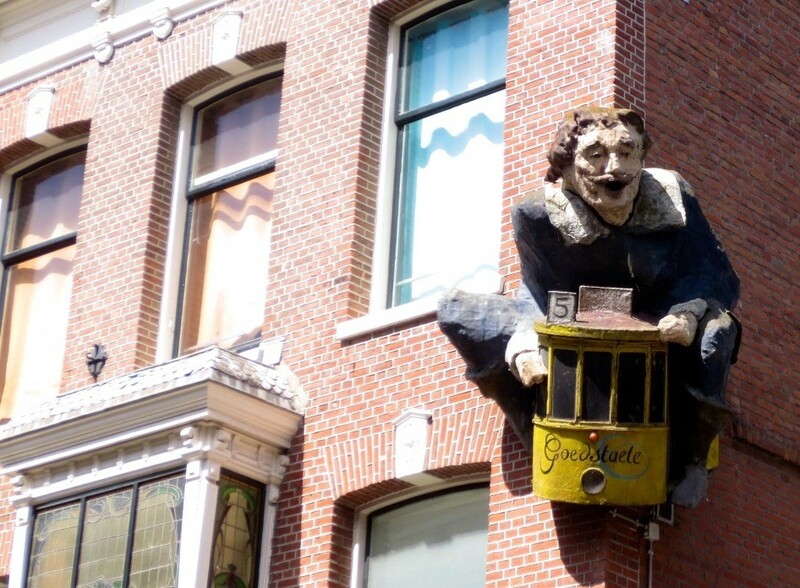 The Hague and its surroundings really deserve your special attention. Time flies and before you realize it, you’ve moved to another place on earth. And then you’ll regret that you haven’t seen more of The Hague and surroundings. But how to explore this nook of the Randstad? By car, on foot? As you know by now, I am an incurable ‘fietser’ (cyclist) and an inveterate pedal stepper, so if it was up to me, I would always recommend the bicycle for your explorations. But I know, I know, it may rain and there is always a fierce wind that will veer round in such a way that it’s always against you. So here is another exploratory option. Hop on any tram. Be adventurous. Buy a day ticket for 6.50 euro and board a random tram. See where it will take you. Get off and have a coffee and ‘appelgebak’ (apple pie) wherever you think it could be interesting and then jump on the next tram or bus. You’ll see places beyond your imagination. Have an early start and by six o’clock in the evening you’ll have seen more of The Hague than many Hagenaars will have seen in their entire life. If you’re not that adventurously inclined, here is another option. Use Tram number 1 as your guide. Tram 1 covers twenty kilometres and takes you from Scheveningen to central The Hague and even as far as Delft. And all that for a mere 6.50 euro. You can buy your day ticket at the various stations or at the Tourist Information Centres in The Hague and Delft. These tickets are also available from the tram driver on Tram 1. Follow this link and you can download a map with loads of information. Do it now! In August! Many Dutch people are away on holidays, so the trams are relatively quiet. Bring your children for a lovely day out. Tram 1 also passes Drievliet Amusement Park. Don’t forget to share your findings with us. 2014 is a good year to start your trammish explorations. 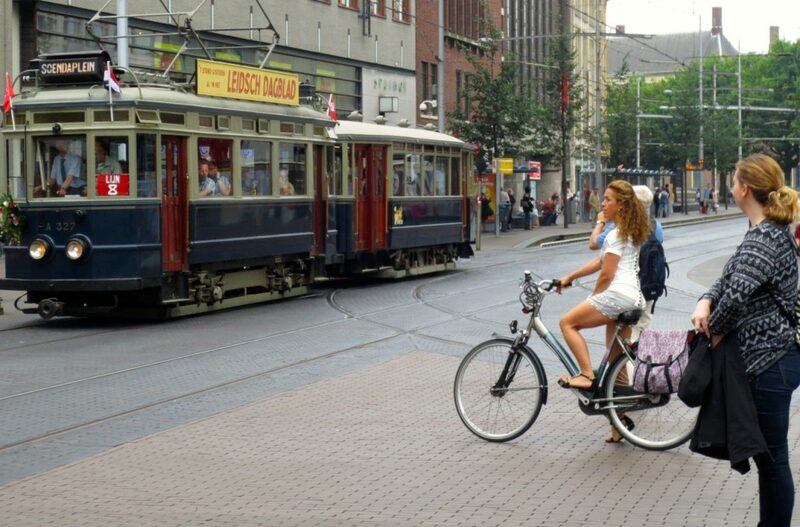 This year The Hague celebrates one and a half centuries of tramways. Yes, one hundred and fifty years ago, in 1864, the first tram rode through The Hague from the city centre to Scheveningen beach. It was a carriage on rails drawn by a horse. The route still exists and yes, you guessed right, number 1 still follows the original line from Kneuterdijk along the Scheveningseweg to Scheveningen and back. A historical ride. On July 5th there was a parade of historical trams. Here you can see an impression of the day. It won’t surprise you that TRAM and ‘trein’ (from train) are originally English words. In the eighteenth and early nineteenth centuries a tram was a road laid with wooden planks or rails for the easier passage of loaded wagons in a coal-mine or above ground, according to the Oxford English Dictionary. Funny how the meaning of words can evolve. The English word ‘tram’ was borrowed from Middle Dutch ‘trame’ or ‘traam’ which meant ‘balk’ or ‘beam’ or ‘rung of a ladder’. The Scots talked about ‘the tram of a barrow’. So the rails on the ground which were connected by ‘tramen’ led to the word ‘tram-road’ which led in 1825 to the word ‘tram-way’. And it was this name that was later given to the carriage gliding forth along the rails. The original meaning of ‘tram’ as a ‘beam between the rails’ and the ‘tramway’ must have vanished when the Victorians started to use the word ‘tram-car’. And when the Dutch borrowed the ‘modern’ English word at the end of the nineteenth century they had no idea that they were reintroducing a Dutch word. So when you travel in the luxury of a Hague tram and marvel at the panoramic views and historical buildings, remember the magical mystery tour of the word TRAM from its meaning as a lowly wooden beam to the popular public vehicle that links the different cultures and activities in the cities of The Hague, Rijswijk, Voorburg and Delft. And don’t forget your button ‘Spreek Nederlands! Met mij!’ In the tram you’ll meet lots of Dutch people who are willing to speak to you and tell you about The Hague.